Recently many organizational contre-pieds obstructed me from working in the wished concentrated way. So i think it's necessary to update all of us about what will go on and when with SWTB. As you know I plan to conclude my research in the second week of February, 10 - 16 / 2 / 2014. My idea was to produce until then 24 hours of test material. In the one-on-one sessions, which we are doing right now, next week and beginning of December, we would discover who will do what during that day. It is not the idea that we all spend 24 hours together, but that we are present and participate in overlapping shifts. A polyphony of individual practice lines (or modules). By midst of December I’ll compose a schedule of lines/modules. From 10 to 14 February we will use the days to refresh our practices/material. The 15th of February I actually plan to try-out the coming in and out of people doing their 'things'. Renée Copraij is planned come that day to Brussels to coach us. Whether there will be enough stuff to fill 24 hours is meanwhile not so clear any more. This has to do with a few works that take much more of my time than I expected. However, it would be great if you could somehow stay stand-by during this week in February. Charlotte Bouckaert will be filming the 15th as well as 16th of February for montage. This movie will accompany my application to the VG/dans (due 1st of march). In case the 24 hours turn out to be too ambitious, we can opt for only filming bits and pieces of material during two days. See and sit with you very soon! 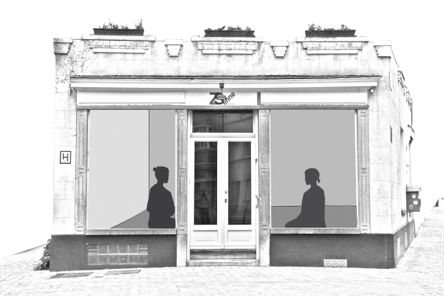 On 15/16 February 2014, at ZSenne artlab, there will be a 24-hour test, concluding the research phase and at the same time previewing what will be elaborated into a piece for the fall 2014. Interactieve installatie voor voorbijgangers / interactive installation for passers by. .zitten met het lichaam is een oefening voor lichaam en geest die ons leert 'naar' . Vertrekkende van deze oefening willen we met het lichaam beelden ontwikkelen die de aandacht die de aandacht van voorbijgangers trekken en hen - voor slechts een ogenblik - uit hun eigen gedachten hale. Je kunt ons zien zitten, elke dag, tot en met 19 mei om 8:30, 14:00 en 17:30. Op andere momenten zie je ons werken aan andere beelden. sitting with the body is an exercise for body and mind which teaches us to 'look inward'. and get them - just for a moment - out of their own thoughts. You can see us sitting, every day, until the 19th of May at 8:30, 14:00 and 17:30. At other moments you see us working on other images. être assis avec le corps est un exercice pour le corps et l'esprit qui nous apprend à regarder vers l’intérieur'. qui attirent l’attention des passants et les captivent - juste pour un instant - les emmenant hors de leurs pensées quotidiennes. Vous pourrez nous voir assis jusqu’au 19 mei à 8:30, 14:00 and 17:30. Les autres moments vous nous verrez travailler sur d’autres images. - a movement research and in the same time a confrontation with the social merit of 'being busy' as an artist. What can one individually do that promotes taking a collective look at reality? During two test-retreats at ZSenne_lab 2012 Renée Copraij and Heike Langsdorf introduced their research by presenting the first image with their two sitting bodies three times a day and started to work also with other people on this image. In 2013 they are developing choreographies which will depart from this first image. They will be carried out by Copraij and Langsdorf as well as by other interested Brussels residents. الذي يجذب انتباه المارة، ويحثهم، ولو للحظة، خارج أفكارهم. في أوقات أخرى سترونا نشتغل على صور أخرى. من خلال الابتداء بهذا التمرين، الذي يعلمنا "النظر الى الداخل"، نريد ان نطور صورا، بواسطة اجسادنا، داخل الفضاء العام المدني، مما سيمكنكم من تجربة الفضاء داخل أجسادكم. الصورة الاولى التي نقدمها، هي هذا التمرين. لما يتم إغلاق الستائر، نكون مشغولين بالصورة التالية.